Help award-winning creative/branding agency Groove promote itself through highlighting its work with high-profile brands ranging from Diageo Wines to Clinique as well as breakthrough marketing campaigns of its own. Groove is a very busy, cutting-edge firm that does groundbreaking work with clients but had little time or capacity to raise its own profile in a competitive space. 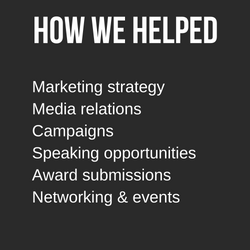 Hart conducted aggressive media relations to raise their profile, including pitching entrepreneur features, submitting best work for industry awards, developing byline articles by agency leaders and developing speaking opportunities and targeted memberships for grassroots outreach. Focus was put on its unique “Get into It” B2B lead generation campaign that included themed events ranging from skydiving to an online chocolate tasting.